We've teamed up with DeBrito Chocolate Factory to create a trio of chocolate delights. 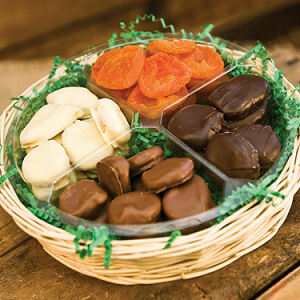 You'll get 1/4 pound milk chocolate covered dried Blenheim apricots, 1/4 pound dark chocolate covered dried Blenheim apricots, 1/4 pound white chocolate covered dried Blenheim apricots, and 1/4 pound Extra Fancy Dried Blenheim apricots. Please note: Ribbons and other gift basket decorations will be seasonal and may not look identical to the photo. Depending on availability, some items may be substituted.